paper bag & string: With Your Support We Surpassed Our Goal to Help Janine's One Person Cat Rescue! With Your Support We Surpassed Our Goal to Help Janine's One Person Cat Rescue! 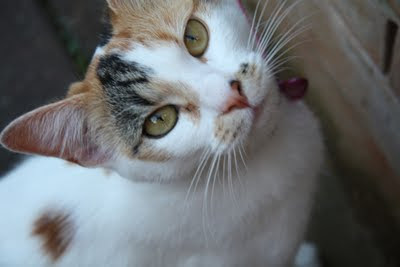 I would like to thank all of my Facebook and Blogger friends who generously donated to Janine's One Person Cat Rescue. As a result of your extraordinary kindness, we contributed $746.50 to Janine Wagner surpassing our goal of $500! I presented the contributions to Janine with this note, "The donation is made in honor of and in the name of my Careers for Your Cat followers." "I am overwhelmed by these people's generosity, total strangers... I am touched beyond words, and my spirit is renewed another day. Thanks to all of you that have helped me, and you know who you are...... xoxo......"
"... I was just floored when I read what you wrote (on my blog), and your readers' comments. You are SO lucky to have the friends and followers that you do!" I totally agree, Janine. I too am touched by the response and good hearts of my followers. I especially want to thank Jenn Brinkley, a Careers for Your Cat Facebook follower, who moved me to action on behalf of Janine's cause. And to Brian Frum for providing me with the moral support to do my first fundraiser for homeless cats who all deserve forever homes. I am totally thrilled that your first fundraiser was such a success, there are so many wonderful helpers out there and I knew you could reach them! Bravo!!! And hooray for every single Janine in the world! Great news!! Ann, you are so wonderful to organize the fundraiser and we are so happy it was such a big success! And we admire Janine for her wonderful work!! This is such wonderful news! Congrats on a job well done, Ann!! Dear Friends of Ann, this is Janine. I wanted to express my sincere appreciation for the funds you raised to help me in my quest to feed and rescue all the homeless kitties that I feed in Rochester, NY on a daily basis. Your generosity has renewed my spirit. Your gift will help with the financial stress I feel each week when I have to buy food for all of them, and it’s a lot! I am amazed to know that there are folks out there that will go above and beyond their every day normal lives to help out a complete stranger. I just can’t thank you enough for what you’ve done for me, but please know that you have touched my heart. Although it can be quite boring sometimes, I hope you will become a regular reader of my blog, as I will become of Ann’s blog. As I told Ann in a personal note, its folks like you that make the following quote true: “Only if we understand can we care. Only if we care will we help. Only if we help shall they be saved.” XOXOXOXO! That's fantastic! Nice job, Ann! !